This month is November (Moustache + November = Movember). I believe that the action has gained such a big popularity mainly due to moustache. Paying money to the Movember account needs a small engagement – in fact, payment is just the final result of the movement. The most important thing is to draw attention to the real problem and to start talking about it. Prevention – this is the main goal of Movember. Wearing moustache through Movember, we encourage men to start making prevention tests and to avoid men’s diseases – mainly testicular and prostate cancer. Why am I talking about it so loudly? Because I became… a face of Movember (how my mean colleagues used to say ;-)) at Objectivity. Last November, we organized the action for the 3rd time. It means that we ask our Mo Bros (this is the way we call our moustache keepers in November) to grow moustache for 30 days. It was no surprise, when 68 men appeared on the list (every fifth male at the company!) willing not to shave for a whole month. During the two last years, we had a similar number of volunteers. Isn’t it impressive? 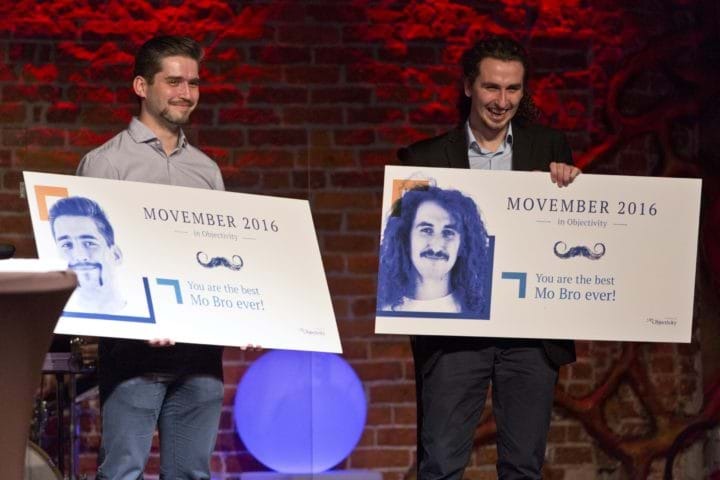 To have a real win-win, the company promised to pay 20 GBP for each Mo Bro to support the action account. So, in one month, we could bring together a little fun and a serious goal! For all our Mo Bros, we prepared blood tests in the company to check out our health. The popularity of the tests was so huge (you’d love to see the queue in the hall!) that we decided to repeat it in a few days. Thanks to two of our company initiatives – Runners Club and The stairs Climb Challenge, we collected some money for supporting the Movember organization. It wouldn’t be possible without employees’ engagement. At the end of November, we organized a company voting to choose the best moustache (before an official voting they took part in a photo session). There were no rules. Every single employee, looking at the pics of Mo Bros, needed to choose one – the nicest in their own opinion. Believe me or not, but it wasn’t easy – all of them looked fantastic (so we had stylish, old-school and Salvador Dali’s disguises ;-)). Anyway, in the middle of December, at the company Winter Party, we found out the voting results. Radek, Szymon and Piotrek stood on the podium (vide photo) and received some small gifts and… a glory! For me, let’s call me a Mo Sista, it was an unforgettable experience – just to be a part of it. I hope the main idea of Objectivity Movember has been fulfilled – to make a virtue of necessity and join fun and help at the same time. Will new technology do more harm than good? Could we really be heading for a future where we cannot safely control our own creations? Or will new technology make the world a better place for everyone.